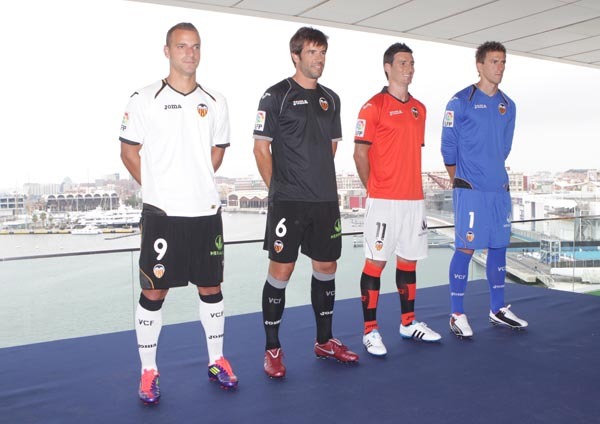 Valencia CF has revealed the new 2011/12 kits made by Joma. The kits are similar to the previous season kits in that they are without stripes and quite simple, but changes in the details make it really interesting and new is the Joma logo obviously. 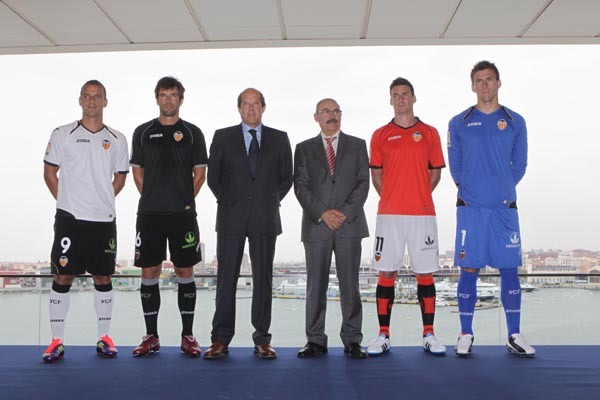 The home kit has a white shirt, black trucks and white socks with a black stripe at the top. The back side is quite interesting of the home kit and I like it quite a bit. The away kit is all black, the shirt is black and has a different detail around the neck-shoulders area, the shorts are black and the socks are black as well with a bronze like color stripe at the top. I don't particularity like this kit so much, I think there should have been a little bit of orange detail on it, to make it look better. The 3rd kit is quite good, it has a orange-reddish color shirt and is quite basic in the looks, white trunks and orange and black socks. The goalkeeper kit is all blue and in the details it resembles the home kit. Overall nice kit designs and I think between the 4 kits (home, away, 3rd, Senyera) people are going to purchase the new kits quite a bit. 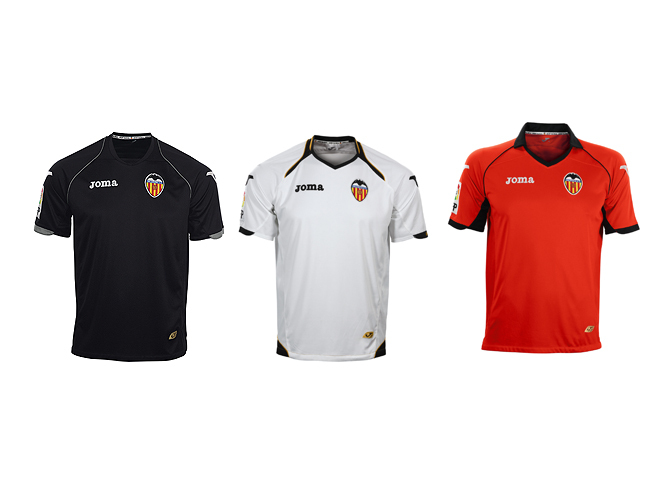 All that is missing is of course a new short sponsor and its said that Valencia CF won't rush to get a new sponsor and try to get as high possible financial offer as possible, before accepting any deal.